The FBM KLCI rose 4 pts, in line with regional markets amid rebound in commodities and expectations of improvement in supply chains following news that Toyota Motor’s output will likely return to normal two or three months earlier than expected. Leading movers were MAYBANK (+5 sen to RM8.70), TM (+10 sen to RM4.12), CIMB (+4 sen to RM8.19), IOICORP (+4 sen to RM5.30) and HLBANK (+30 sen to RM11.50). The local market should continue its sideways consolidation given the absence of fresh market leads, ongoing external uncertainties and 1Q11 reporting season. Technically, following a steady base building over the last two weeks, there is a possibility of an upward consolidation from now in anticipation of +DMI to stage a crossover above the –DMI and the bottoming up signs in momentum and trend indicators. 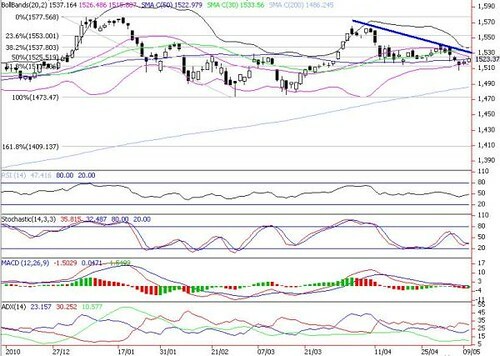 Immediate resistance target is DTL around 1530, followed by 1533 (30-d SMA) and 1537 (38.2% FR). Retracement supports are situated at 1513 (61.8%) and 1498 (76.4% FR). Further supports are 1487 (200-d SMA) and 1474 (6-month low). FBM KLCI Shows Some Signs Of Optimism As The Technicals Gradually Improve.